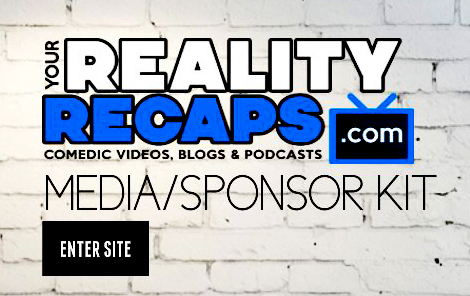 This week in Nerdvana… Konnie calls all nerds to the courtyard and out into the rain; and I am vicariously enjoying it because it is HOT and HUMID in Kansas. The nerds; however, do not seem to be enjoying it as much as I would be, especially Matt and Emily. Even more so, Matt is not thrilled about the next Nerd War – Castle Building followed by Caste Destruction by the other team. It’s like Angry Birds – I mean Angry Nerds. Karen and Yasmeen are actually thinking this will be pretty cool and while Kerry doesn’t know how to build a castle, she’s pretty sure she can knock one down. Each team has two hours to design a blueprint for their castle and each one must use a max of 272 blocks, 250 wooden spikes to hold it together and must feature four walls, a window, a door and stand at least eight feet tall. In Team Evil’s lair, Emily feels confident and qualified – she builds castles out of Lego all the time! Her inspiration is Helm’s Deep from Lord of the Rings. She would like to build a sort of step pyramid and put all their support at the bottom to make it harder for the other team to knock down their castle. Very good idea! In the Defenders’ Den, Karen has taken total control of this challenge and Kerry and Kenny are very annoyed by it. Meanwhile, Team Evil would be more aptly named Team Totally Working Together As A Cohesive Unit because they are. Everyone is digging Emily’s idea, they think it’s solid and it’s all puppies, kittens, hearts, flowers and rainbows over there. Things with the Defenders are not that that solid. Karen won’t let anyone get a word in edgewise, Kenny and Kerry are getting even more annoyed with her – how does a PHD in snakes qualify someone to build a castle? That’s what Kenny would like to know! Curtis points out that even though she is a bit of a “down talker”, Karen is one of the strongest members of their team and he doesn’t seem to be bothered by her strong-arming this Nerd War. As the tension rises in the Defenders’ War Room, everything is still relaxed and groovy with Team Evil. Yasmeen and Hannah take to the outdoors again to practice with the ball launcher so they can train the others on how to use it. Yasmeen even clips her nails – that’s how serious she’s taking this Nerd War. #sadtimes indeed! Emily thinks Hannah will have good aim, but Yasmeen’s power will blow right through the walls of the other team’s castle. For the Defenders, Kerry and Matt are more than happy to get away from Karen to go practice with the launcher. Matt didn’t even want to do it, but he’d rather be outside playing with balls in the rain than be inside with Karen’s voice in his ears. Inside, Karen and Curtis are working hard on castle construction while Kenny thinks it’s time to test the structure they have built and he would like Karen to stand behind it while he chucks a ball at it. Returning from practice, Hannah and Yasmeen return to their fellow Team Evil members, they all agree to take direction from Emily and everything is still completely peachy keen. Time for the Nerd War! Since a castle building challenge isn’t complete without judges, Konnie introduces Paul Inglis, art director for Game of Thrones (and more), and Game of Thrones actor, Kristian Nairn! I’m such a bad nerd for not watching or reading Game of Thrones. I don’t know why I just cannot get “into” it. It’s shocking, I know, and I’m weird. Anyway… Paul will be paying attention to how each team handles the unexpected challenges they will face in the competition and Kristian will be focusing on aesthetics aaand he also wants to be able to fit through the door. *record scratch* Hold up. He has to fit through the door? Mark is a little concerned that “Hodor” will have some trouble with that as far as their design is concerned. And ready, set, HODOR – it’s time to get to work on construction and they have 40 minutes to build their castles under the watchful eyes of the Konnie and the judges. This is when the team dynamics do a total 180. The once calm, cool and collected Team Evil is now lost in chaos while the Defenders of Time have hit the sweet spot under Karen’s leadership. 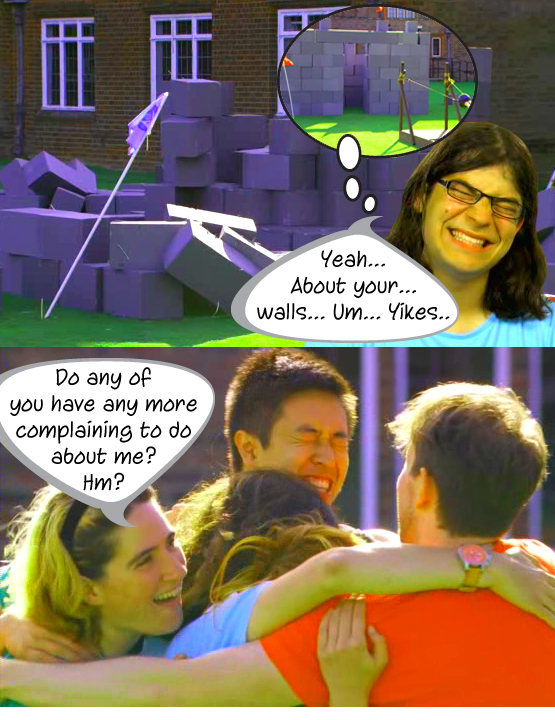 Like a well-oiled machine, Karen’s minions are working smart and efficiently, and appreciating the self-proclaimed leader, while Team Evil flails about battling the harsh winds that are sending their castle blocks to the ground before a single ball has been launched. Things do not look good for Team Evil. When time is up for castle construction, Konnie informs that the judges will be awarding an extra ball for the team with the best castle design – as the wind pushes more blocks off and away from Team Evil’s structure. As Paul and Kristian walk around their structure, Hannah has never been more embarrassed in her life and Emily knows this is all her fault – she didn’t even think about the wind! 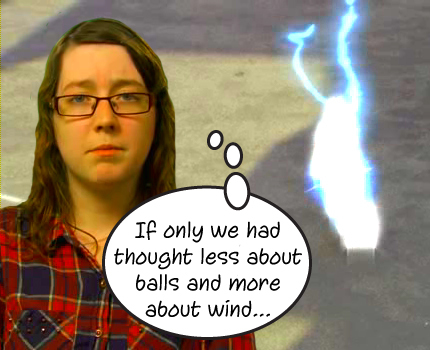 Emily had balls on the brain, just balls and only balls. The Defenders’ castle is holding up very nicely, though, and their more traditional design wins over both judges – they will get an extra shot at Team Evil’s “castle”. They also get to choose between shooting first or second and they choose to let Team Evil have a go at their castle first. Speed up the film and cue the Benny Hill music because this ball launching sequence is a total farce from the start. Clearly, the Defenders of Time have built a solid, sturdy, and WIND RESISTANT structure and I don’t know what happened to the lovely design that Emily dreamed up, but the plan was not executed as precisely as Karen’s was with her team. 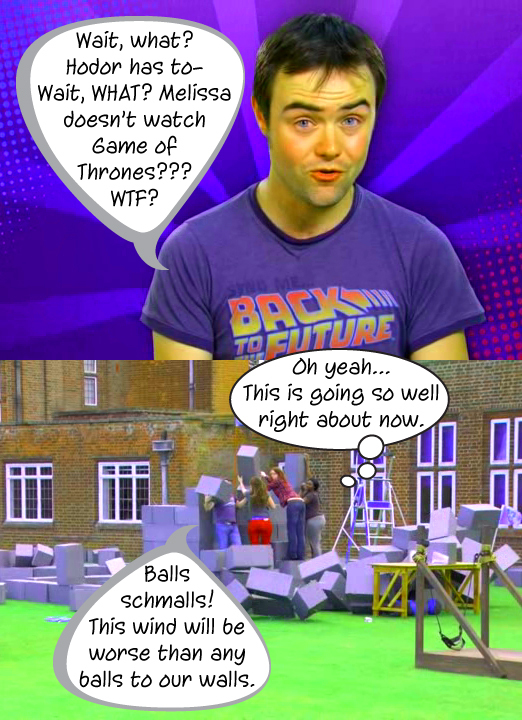 Like points in Who’s Line Is It Anyway?, the balls do not matter in this competition. The Defenders of Time have win this Nerd War and will enjoy a banquet, with “Hodor” and Paul, in Nerdvana as a reward. After Team Evil has a wonderful time destroying the Defenders’ castle, the winners are whisked away to their special dinner. Karen thanks everyone for putting up with her barking orders at them, but there is no love lost because they are super excited about this banquet. While the Defenders of Time get to the business of enjoying their awesome reward, Team Evil is obviously getting to the business of who they will send into this Nerd War. Yasmeen thinks it should be the person who performed the worst in the challenge. Emily wants everyone to be honest and so no one is surprised by the vote; she thought her design was good, but it wasn’t – if they are going to vote her in, she wants them to tell her now. Hannah says to us that she will be voting for Emily then the group sort of stalls at giving Emily an answer. Back in the banquet hall, the Defenders are having a lovely time nerding out with Kristian and Paul; Hodor loves Nerdvana of course and has a lot of nice things to say about their castle. 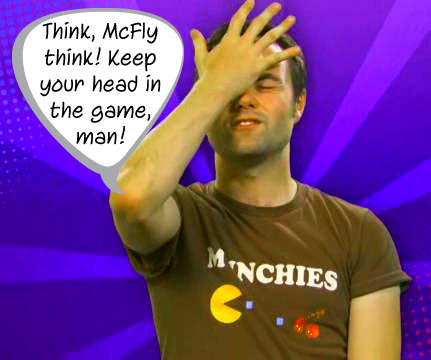 Instigating a little game talk, he asks Karen who she would vote into the Nerd Off – quick now! Just answer! She says Yasmeen just because she hasn’t seen much from her and would like to see how she performs. We now rejoin Team Evil and Emily is bringing scrabble tiles into the business of voting someone into the Nerd War. Each person is given four tiles with the first letters of each person’s first name on them. Everyone lays down a tile to vote, Emily mixes them up a bit then turns them over – Hannah receives the majority vote. Yasmeen explains that she was going to tell Hannah about her vote and that it’s nothing personal; it’s that Hannah could have done more in the Nerd War to help the rest of the team. A very upset Hannah leaves the room, asking that no one else feel bad. She just really doesn’t want to go home and doesn’t think it’s her time to go yet. 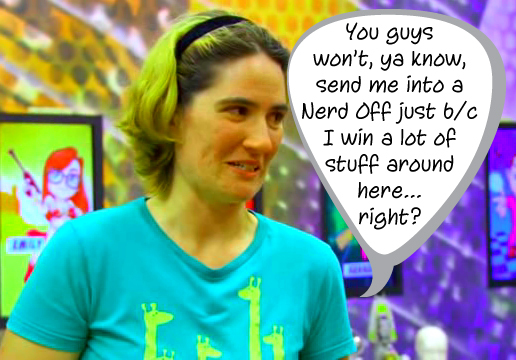 To the Throne Room… After a good jab at the Extremely Valiant Independent LOSERS by Konnie, Team Evil doesn’t have much to say in defense of their Nerd War performance then she reveals their vote. It’s Hannah and she’s decided to keep calm and nerd on through this, but she will fight to stay in the game against her team mate. By a majority vote as well, the Defenders of Time have chosen… Mark. Hannah did not want THAT to happen. She does NOT want to go up against quiz team champ Mark, who is also ready to fight to stay in the game. This week’s Quiz Bowl topics are: Board Games, Middle Earth, Space Vehicles, and Superhero Films. For Hannah, Mark chooses Middle Earth for Hannah and she chooses Board Games for him. And yeah, I’m with Matt on this one, Mark… Hannah is all about Middle Earth. Your strategy does make sense. You certainly would not want the Hobbit Head to choose it for you, buuut… For study assistance, Mark chooses Curtis, he accepts, and Hannah chooses Emily after she volunteers. Oh yeah, Hannah remembers, Emily can write in dwarfish! This is when Mark facepalms; he might have just given this Nerd Off to Hannah and I have to agree. I know what you were thinking, but what were you THINKING, Mark??? 🙂 Konnie dismisses the Nerds and the foursome takes to the study room. Mark is especially regretful of his decision when he sees how confident Hannah seems working with Emily. He’s never seen her like this before. Meanwhile in the living room, Yasmeen and Karen are playing Robot Football while they discuss what losers they are and how they will not be losers in the next one then we’re back to the study groups. Hannah is sooo ready for this. It’s going to be a bloody battle and there will be a victor. To the Nerd Off! The Wild Card round is back with anagrams this week and according to Mark the tension in the room could be cut with a light saber. After botching up the answer to the final Wild Card round question, Mark is still ahead with six points to Hannah’s four. If he wouldn’t have blurted out the correct answer after giving the wrong one first it might have ended up six to two. Why do you keep giving Hannah advantages, Mark?! lol The Quick Fire round is next, Mark is up first and he sets the bar at 17 points proving that his status should be Professor Quizzy Quiz, not just Mister. This makes Hannah very nervous. She needs 14 points to win and she’s not sure she can even make it through that many questions in 90 seconds. When Hannah’s round starts, she passes on the first question, misses the third, aaand the pressure is really starting to get to poor Hannah. All the confidence she built up within herself seems to have been destroyed by Mark’s excellent performance because at the end of the round, her point total is at ten. 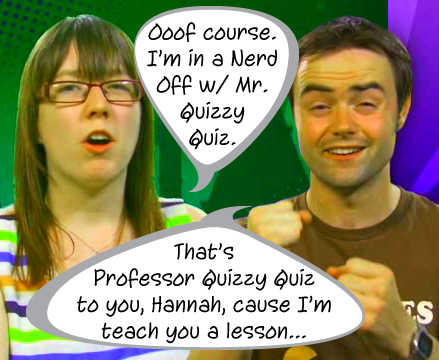 After Hannah’s “shocking” exit, the nerds retire to Nerdvana and no one wants to go up against Mark in a Nerd Off, he proclaims himself the new captain of Team Evil aaand… Yasmeen and Emily have something to say about that next week and I hope they save some of it for the competition because it’s Nerd Debate time!